Welcome to DIY Fireplace Overhaul part 3 . 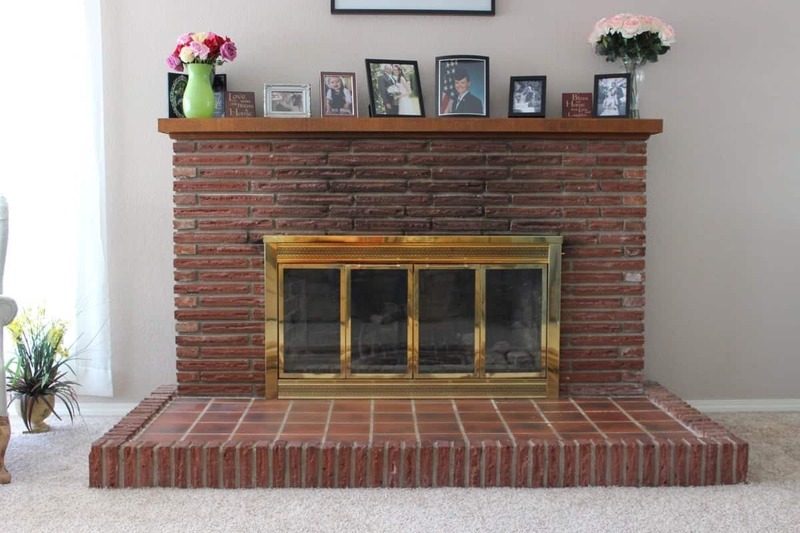 This is our third post about how we transformed our ugly old brick fireplace into a masterpiece focal point for our home. The Fireplace has been painted white and we are installing a gorgeous stained cedar wood hearth with an epoxy coating for a bar top finish. 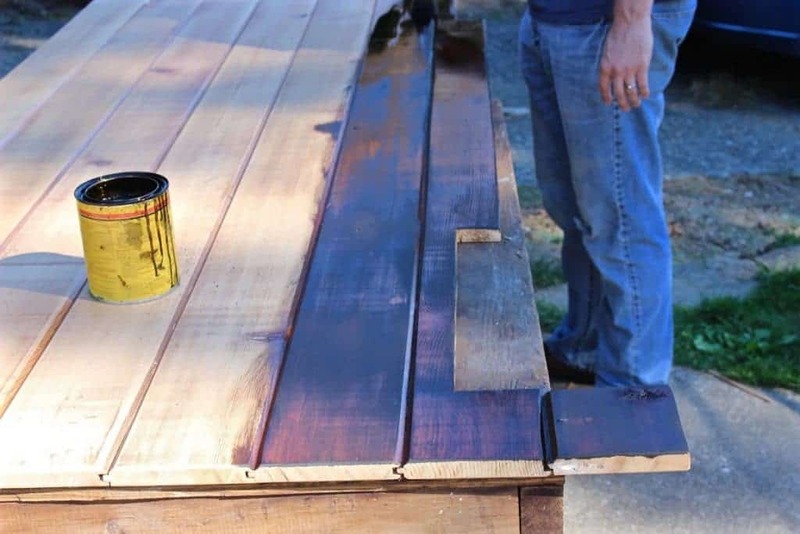 We put a bar top finish on our stained cedar panels by applying an epoxy layer on top of the hearth. 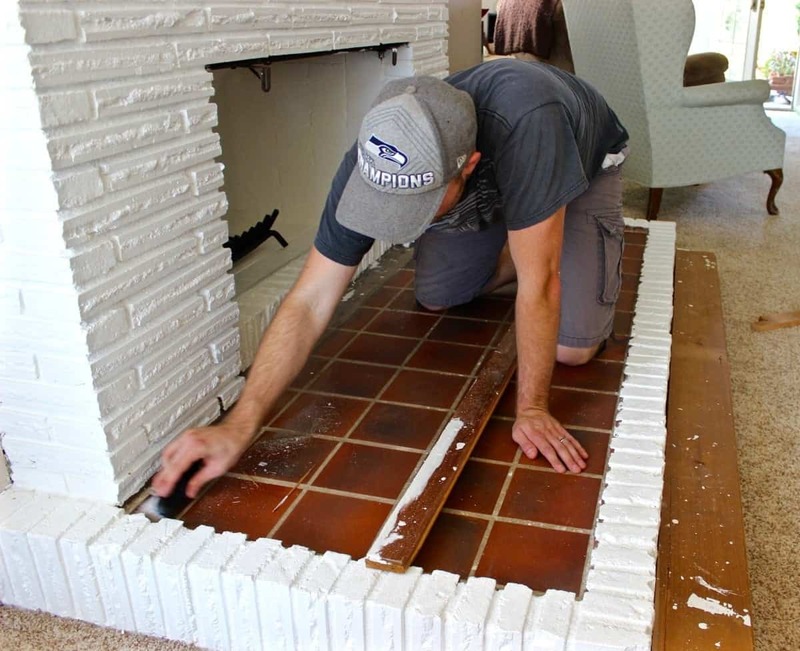 We left off with the painting of the bricks in DIY Fireplace Overhaul Part 2. If you’ve missed this entire series, DIY Fireplace Overhaul Part 1 might be of interest to you as well. We are absolutely thrilled with how our fireplace paint job turned out. Our old shabby, brick Fireplace looks fantastic with it’s new paint job. Our reveal Video shows you the finished fireplace and has a discussion of all we did and why we did it. 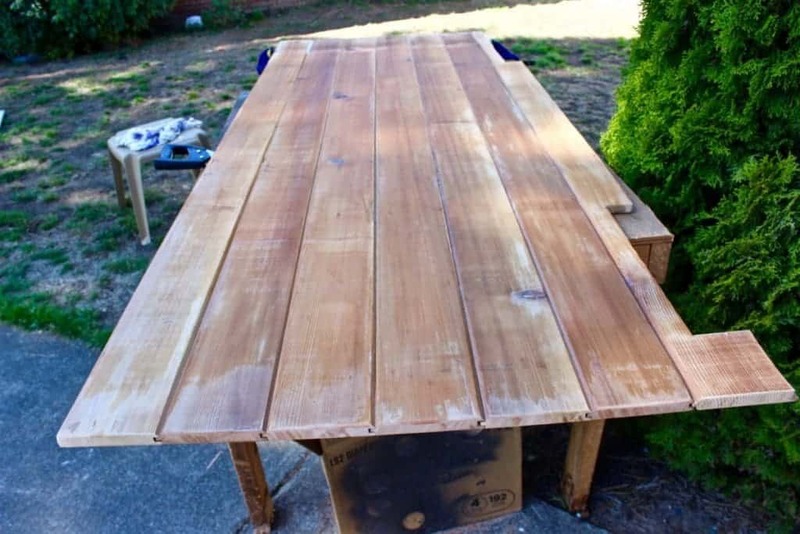 This post is a how to on making the hearth and finishing the top with epoxy. 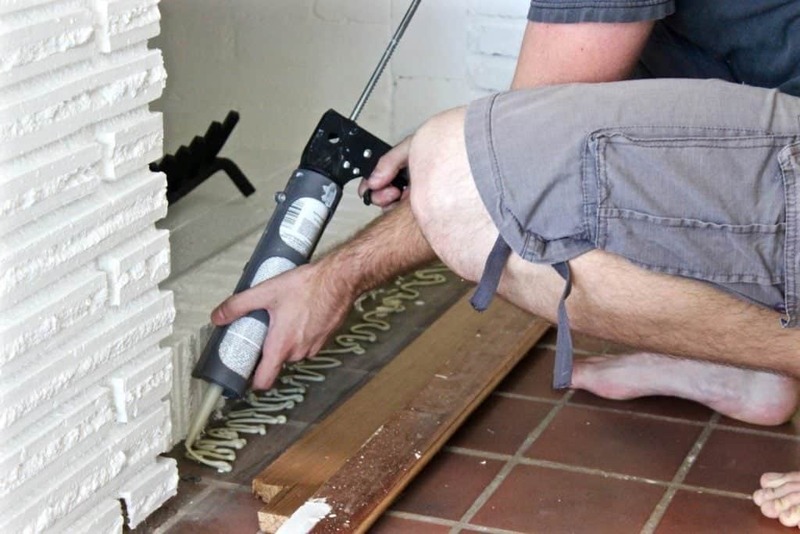 This post, DIY Fireplace Overhaul part 3 is a tutorial on making a wooden hearth to go over top of our old brick hearth. 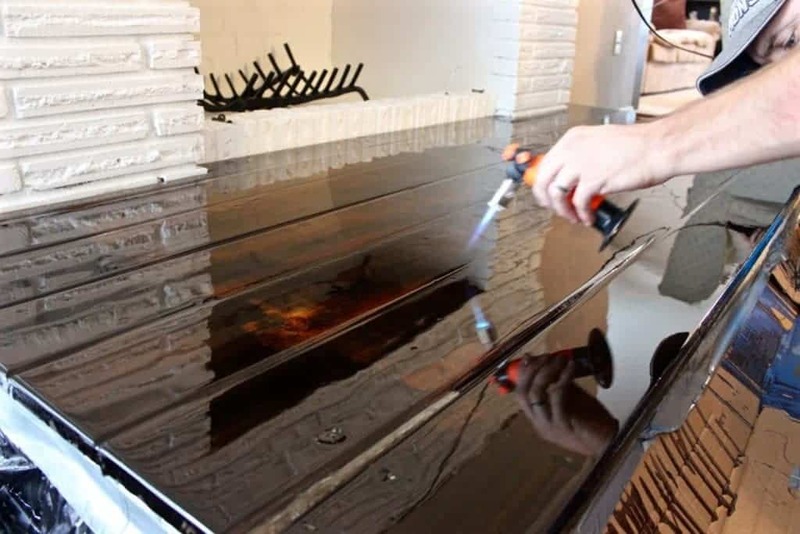 We made the decision to do an epoxy coating on top of our stained cedar wood hearth because we liked the durability and shine that it has to offer. Quite the show stopper as it turns out! DIY Fireplace Overhaul Part 3 tutorial is going to contain a lot of pictures, it’s really more of an idea post for you to feel inspired about redoing your own fireplace! I realize that everyone has different layouts and materials that they are working with, but here is how we did our renovation! it was less than $300 for all of the materials that we needed. We reused everything that we could. The cedar wood we used was from a bedroom in the basement that we demolished when we moved in. Keep in mind, our fireplace is blocked up inside by the previous owners and can’t be reclaimed for wood burning. Our fireplace hearth will never be near, or used for actual wood burning. No logs will ever scuff it up. And no fire will ever get near this cedar wood, epoxied, hearth! So we are transforming it into a lovely focal point for our home! Building and refinishing your own wooden hearth takes some time. We outline all the steps we took in this process below along with the time required to finish each process, including drying times. Notice that we painted the upright bricks when we painted the fireplace? Now we have a good painted base for the hearth to rest on. We did have to give those bottom bricks another coat after the epoxied top was done to cover the drips left on those bottom supporting bricks. We used dawn dish soap with vinegar and water to make our own cleaning solution. That stuff works amazing and it cleaned that old brick up in no time! We cleaned and measured the hearth length. We were extremely eager to cover up that old brick! We felt those jagged edges were just too dangerous for our infant daughter to climb around on. We used construction adhesive to glue down a bottom layer of wood. We had a lip of about 1 inch that we had to level out before we could put the hearth top on. The construction adhesive was easy to use and held the wood down beautifully. We used construction adhesive to glue down the wood pieces and make the bottom layer for the hearth. The next step was sanding and staining the wood hearth pieces, we glued them together with wood glue and let it sit for 48 hours. These pieces of wood were walls to a bedroom we tore apart when we first moved in to our home. We upcycled some of the boards into this gorgeous hearth. We used old cedar panels that we found in the basement when we moved in. Staining the hearth pieces was a long process. It required a few different coats to get the even tones that we wanted. We also had to keep sanding the stained coats in between to ensure an even finish. Staining takes a long time so be prepared to wait! you need to wait at least 12 -24 hours in between each coat that you apply. We used dark walnut stain to get this deep brown color. As soon as the stain was set and dried we were able to bring in the wood hearth and glue it down to the top of the bricks and wood that we had set in place. Again, we had to wait 2 days for the wood to really settle in and dry. We poured the epoxy and had a couple of friends over to help us spread it out before it started to set. Once we glued the final layer of wood on top of the bricks we were ready to pour epoxy! You have to have a blowtorch to smooth the wrinkles out of the epoxy and to pop the small bubbles that form underneath the surface. This will give the epoxy top a nice smooth finish. A blowtorch is used to smooth out wrinkles in the epoxy and to pop small bubbles that form under the surface. Gorgeous, highly reflective, epoxied, cedar hearth work so well for our northern climes! The final coat needs a while to set and dry before you walk on your shiny new hearth top! We absolutely love the way it turned out. It’s really gorgeous and it reflects light beautifully off the top of it. It’s a soft and smooth surface to walk on and it’s much safer for our baby to crawl on then the old harsh bricks. I hope you feel inspired to try something like this! It was a gamble and it was really scary pouring epoxy over the gorgeous stained wood, but it turned out beautifully! I am so much happier with it than I originally thought I would be! We hope you are inspired to recreate your old fireplace using our ideas! This is what we started with! We changed this old brick beast into a gorgeous new living room feature. Our final piece of the Fireplace Overhaul is building it a wooden mantle. We never did an actual post on how we put the mantle together. If you watch the reveal video I will tell you how we did it. It was just what this old fireplace needed as a final touch. We are currently in the process of remodeling nearly our entire home. 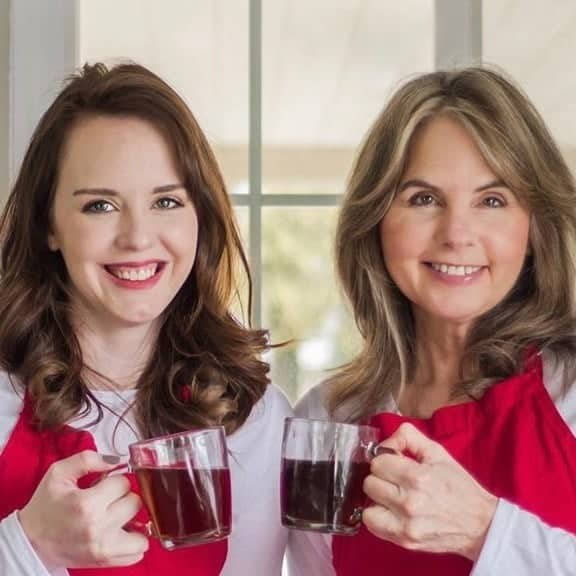 Subscribe to our This is Our Home YouTube Channel and follow our progress as we continually update our home. We love DIY and you will find out how we saved a ton of money by doing everything we can ourselves. This old fireplace is slowly getting transformed into an updated gorgeous new feature. This is an exciting project to watch in progress. Can’t wait to see all the before/after pictures. Good job, Brian & Kayti! They have it done now and it turned out Fabulous. I just need to get them to do a final post and reveal.